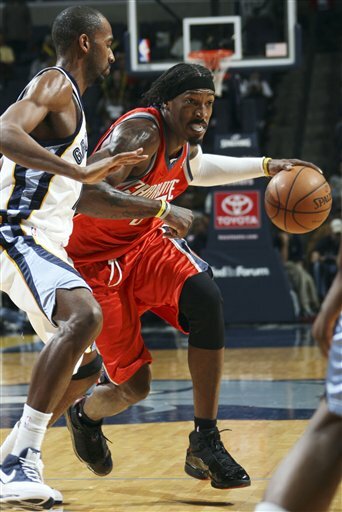 Gerald Wallace tipped in the game winner at the buzzer to give the Charlotte Bobcats an 89-87 win over the Memphis Grizzlies at the Cable Box on Saturday night. AP recap here, box score here. After a roller-coaster fourth quarter that featured two huge Flip Murray threes, some inexcusable missed free throws by both teams, and an amazing Gerald Wallace block of an OJ Mayo layup, Mayo was able to hit a game-tying three with 8.8 seconds left, 87-87. Out of the timeout, the ball went to Raymond Felton. Felton started his move on DeMarre Carroll with a few seconds left, but Carroll played tough D, pushing Raymond to his right and never allowing him into the lane. Felton had to throw up a wild runner that missed everything long, but Gerald Wallace was crashing the boards from the opposite side. Crash timed his jump perfectly, rose up over everybody, caught the miss cleanly and dumped it back into the basket before time expired for the win. The Bobcats were frankly lucky to have the opportunity to win this one. Some old bugaboos came back into play: turnovers (18) and missed layups (at least 10) were aplenty. Stephen Jackson had a poor game statistically (6-20 FG, 0-3 3PT, 6 turnovers) and the bench (save Flip Murray) didn’t play all that well. The Cats were down by as much as 13 late in the second quarter; they chipped away during the third and finally evened things up halfway through the fourth. The Grizzlies are one of the league’s pleasant surprises thus far and they showed why tonight. Even without starting PG Mike Conley (Marcus Williams got the start) they looked good. OJ Mayo, Rudy Gay and Zach Randolph and Marc Gasol looked like a cohesive bunch. Hasheem Thabeet even made himself useful with a couple of blocks and a perfect 2-2 FG/2-2 FT night. The bench is kinda bare, though. The Cats improve to 13-4 at home, 16-19 overall; that’s good for 7th place in the Eastern Conference. Any Baseliners struggling with their weight might want to get up with Marc Gasol. Dude’s personal trainer/nutritionist/chef situation is on point, as he’s gone from Stanley Roberts-esque to Pau Gasol-esque since last year. Tweet of the night comes from Nazr Mohammed: “I’ve played on a couple of teams & with a few allstars. G Wallace is having that type of season. It would b a travesty if he doesn’t make it” Right on, Naz. Next game is Tuesday night, the Cats are hosting another pleasant surprise from the Western Conference, the Houston Rockets at 7PM ET. 1. Sleepy, sloppy win for the Bobcats at the Cable Box tonight, 101-86 over the Grizzlies. AP story here, box score here. The Bobcats move to 17-25. 2. This one bore some superficial similarity to the Bobcats win over the Grizzlies in Memphis a few weeks ago, in that the Bobcats cruised to a relatively easy victory against a listless, overmatched Memphis squad both times. It’s really nice to see the Cats continue to take care of business against the handful of teams in the league that they’re actually better than. 3. After some nice crowds recently, attendance was pretty down tonight — and for the first three quarters, the fans that were there didn’t have much reason to get excited. This game was not played at a high level from an energy or execution standpoint. The two teams combined for forty turnovers and generally looked like they had agreed to a secret pact before the game to play at half speed. All that said, the Bobcats were clearly the better team, and were able to pull away in the fourth quarter by tightening up their defense and getting some easy buckets of offense. 4. Through those first three slow-played quarters, Raja Bell was the only Bobcat who could get anything going. He hit mid-range jumper after mid-range jumper to pace the Cats with 25 points. And in another similarity to the fist time these two teams played, Bell hounded OJ Mayo into a distinctly below-average game. 5. The rest of the Bobcats starters had solid games: Emeka Okafor had a man’s game, with 20 points (6-9 FG, 8-12 FT), 15 rebounds (4 offensive), 3 steals and 3 blocks. 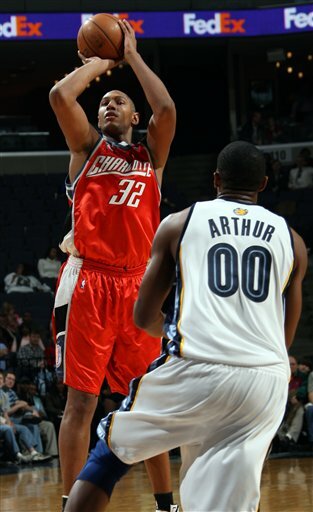 Diaw was sorta quiet, but ended with a patented 8 point, 8 rebound, 7 assist game. Wallace had a Diaw-esque game with 13 points, 9 assists, 7 rebounds and 4 steals. Felton shot the ball pretty well (7-13 FG for 19 points) but had an unsightly six turnovers. 6. And that’s about it for the Cats tonight. The bench was pretty awful — just look at the +/- numbers on the boxscore. DeSagana Diop made his debut for the Cats, playing three quiet, forgettable minutes after receiving a nice hand from the crowd. Adam Morrison played 13 brutal minutes, shooting 1-3 and grabbing five rebounds, but committing three turnovers (two on travelling violations) and two fouls. He’s passing up decent shots and basically looking skittish out there. I hate to have to say this about a rookie (he shouldn’t have this much pressure on him) but the team is really missing Augustin’s scoring and leadership off the bench. With Carroll gone, Morrison a mess, and Augustin likely to move into the starting linuep if/when Felton is traded, I shudder to think about our backcourt depth down the stretch. Here’s your opportunity, Shannon Brown. 7. Re: the Grizzlies? Now granted, I have a biased sample to go on (2 losses to the Bobcats) but this team plays with no heart whatsoever. Rudy Gay is very talented, but the knock on him coming out of college (doesn’t have the temperment/personality to lead) is proving to be true. He disappears from games far too easily. OJ Mayo works hard and is very fundamentally sound, but has looked very pedestrian in the two Bobcats games. And they’re a mess at point guard — Mike Conley looks OK, but had a frightening -23 +/- tonight. 8. Man, watching Darius Miles in person made me hate the Trailblazers even more for what they tried to do to him. He’s clearly still an NBA player, and for a guy who’s still working his way back into game shape, looks pretty springy out there. I’m just impressed that he’s been able to keep his mouth shut about the raw deal the Blazers tried to give him — I’d be spewing all sorts of vitriol their way if I were him. Congratulations, Trailblazers: you did the impossible and turned Darius Miles into a sympathetic figure! 9. Next game should be a good one — Friday night at the Cable Box against Phoenix. Though they’re no longer playing D’Antoni’s Seven Seconds or Less style, the Suns are still a marquee team with Nash, Stoudemire and Shaq. And there’s the added significance that, since the big J-Rich for Diaw & Bell trade, both teams are playing their best ball of the season. 1) Surprisingly easy win on the road tonight against the Memphis Grizzlies, 112-83. AP story here, box score here. The Bobcats get just their second road win of the season, improving to 9-18 overall. The Grizz, who had won 5 of their last 8, fall to 9-17. 2) Another day, another trade rumor for the Bobcats. Thursday morning, Rick Bonnell reported that the Warriors and Bobcats were talking about a Raymond Felton for Anthony Randolph OR Brandan Wright deal. Though I’m an avowed Raymond Felton fan/apologist, the play of DJ Augustin and the potential of both of those young Warrior forwards had me saying YES YES YES just like Rufus on Fire was. Nothing’s gone down yet, but Tim Kawakami of the San Jose Mercury news reported Friday afternoon on his blog that things in Warrior-land are very tense right now; anything could happen. 3) Gotta call out Bobcats TV analyst Henry Williams, who was rocking an awful, pea-green, Craig Sager-wannabe number tonight. Awful — words can’t do it justice. 4) So anyways, a great game by the Bobcats tonight. Probably the best game they have played all year — everything was working. Midway through his fantastic first quarter, Emeka Okafor got two straight buckets to give the Cats a 15-10 lead, and they never looked back. The Cats won every single quarter, and save for a short stretch late in the third where we settled for some marginal shots, always looked in control. The Cats finished the game shooting 65.8 % (a franchise record! ), dominated the boards 41-23, and had 35 assists. 5) Okafor had yet another strong game, with 25 points on 11-16 FG, 7 rebounds, 3 assists and 1 block. He made several strong post moves (against the Grizzlies admittedly underwhelming duo of Darko Milicic and Marc Gasol) and got a bunch of easy buckets on putbacks and feeds from Boris and Raymond. Okafor is really playing well with Diaw; let’s keep an eye on this going forward. 6) Speaking of Diaw, he has to get player-of-the-game honors tonight, going for 26 points (11-13 FG, 4-4 3PT), 10 rebounds and 3 assists. He has looked more motivated since coming to the Bobcats than he has in years, and is an immense upgrade over the Sean May/Jared Dudley PF-by-committee that we had been seeing. 7) Great to see Gerald Wallace back in the lineup: 22 points (9-11 FG), 9 rebounds and 4 steals. The Cats didn’t need much else; Matt Carroll was the only other Bobcat in double figures with 10. DJ only shot 3 times tonight, and ended up with 10 assists versus 2 points. Not often you’re going to see that kind of ratio from DJ. 8) First good game for Raja Bell tonight, as he absolutely shut down Memphis super-rookie OJ Mayo. Mayo went 2-10 for 7 points in 28 minutes, well under his gaudy 20.8 PPG average. 9) Memphis has real trouble at their PG spot. They started Kyle Lowry, but gave more minutes to Mike Conley — neither were effective. At one point in the second half, Conley nervously passed up an open look at a three, which drew the ire of all 17 Grizzlies fans in attendance. Conley’s still just a 21-year-old second-year player; nonetheless, the Grizzlies have to be disappointed that he hasn’t shown much progress. 10) Next game is Saturday night, hosting the Warriors at the Cable Box at 7:00. Another Saturday night in December, another holiday party — which means I’m passing my tickets to Mom & Dad again and will be DVRing the game (that is, if my dubious Time Warner cable box cooperates). Could be interesting, what with the Bobcats playing so well tonight and the Warriors in the midst of a tough stretch in their schedule and apparently at DEFCON 2. 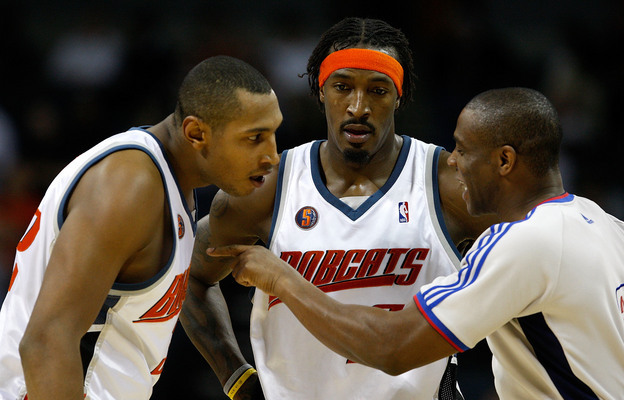 Welcome to Part Four of a five-part look at the 2008 NBA Draft from the perspective of the Charlotte Bobcats. Part One was a basic look at the Bobcats’ needs this offseason. Part Two took a detailed look at the draft lottery process which determines where the team will pick. Part Three examined the Bobcats’ options if they should luck out in the lottery and move up into one of the top three picks, while Part Four is a look at the team’s potential choices if they stay in their spot with the eighth (or ninth) pick. 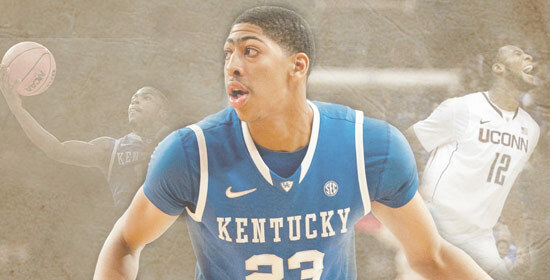 Part Five will consider the Bobcats’ second round pick. Welcome to Part Three of a five-part look at the 2008 NBA Draft from the perspective of the Charlotte Bobcats. Part One was a basic look at the Bobcats’ needs this offseason. Part Two took a detailed look at the draft lottery process which determines where the team will pick. In Part Three we will examine the Bobcats’ options if they should luck out in the lottery and move up into one of the top three picks. Part Four will be a look at the team’s possible choices if they stay in their spot with the eighth (or ninth) pick, while Part Five will consider the Bobcats’ second round pick.